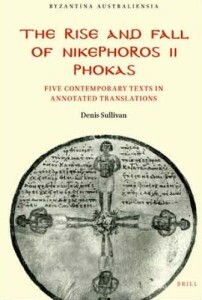 In The Rise and Fall of Nikephoros II Phokas, Denis Sullivan presents five Byzantine Greek texts that document the remarkable career of Nikephoros II Phokas, emperor from 963 until his death in 969. The first three texts are historical chronicles covering the period 944-963, which sees Nikephoras’ rise from military general. The fourth is a “historical epic” poem on the successful Byzantine expedition against Arab Crete in 960-961, for which Nikephoros was the field commander. The last text is a liturgical office that declares the slain emperor a martyr and a saint. These texts, translated into English for the first time, provide information on the Phokades that is not found elsewhere in the Greek sources, and the chronicles appear to reflect now lost pro-Phokan family sources.